I was in Haiti with a humanitarian organization when four names changed my life: Fay, Gustave, Hanna and Ike. Those were the names of one tropical storm and three hurricanes that struck Haiti, one after the other in less than a month in the late summer of 2008. It was the first time I experienced such apocalyptic devastation firsthand. I had been working in the northern city of Gonaives, which was hardest hit by these storms. Like much of Haiti, there were virtually no trees on the surrounding hillsides and consequently those hills served as funnels to catch the torrential rain and send it rampaging down to the farmland below, where it picked up rich topsoil as it headed towards the city. It took over a year to dig out several feet of compacted soil deposited on every street and the ground floor of every home and building in the path of the floodwaters. Strive as much as possible to become proficient in the science of agriculture, for in accordance with the divine teachings the acquisition of sciences and the perfection of arts are considered acts of worship. – Abdu’l-Baha, Selections from the Writings of Abdu’l-Baha, p. 144. 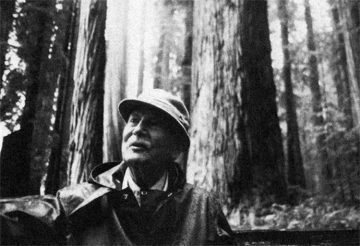 The decision to plant trees also honored my first mentor, the great forester, environmentalist and Baha’i Richard St. Barbe Baker. His spiritual and practical example led to my 30-year career of international humanitarian service before coming to Haiti. He also influenced a lifetime of environmental activism on my part, including several early years directing forestry programs under the auspices of the United Nations. 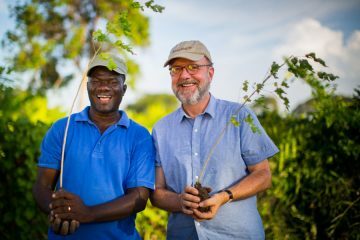 What I didn’t know at the time was that my decision to plant trees in Haiti would lead to a revolutionary new business model using tree planting to transform smallholder farmers into a self-financed and profitable force for change … and not just in Haiti. That term—smallholder—refers to farms that are 2 hectares or less, which translates to 5 acres. I initially assumed these were subsistence farmers who grew only enough to feed their families, and barter what was left for other basic needs on a no-cash basis. However, Gustave and his wife Rosemary set me straight on this point. They were among the first smallholders I met in Haiti. They farm together on a modest plot of land and grow onions, corn, eggplant and beans, depending on the season, selling their produce in local markets. Because they sold their vegetables, plus eggs from a few chickens, they were not subsistence farmers—they were small business owners. But hard working as they were, low yields kept them locked in a cycle of poverty. It broke my heart when I learned that several of their seven children weren’t in school. This wasn’t because some had to stay home to work on the farm, as I first thought. It was because the majority of Haitian schools are private and require tuition, starting in grade one, and the family couldn’t afford to pay for all their kids. What really struck me about this family and other smallholders I met throughout Haiti was that they were so completely marginalized and forgotten, just like generations before them. As it turns out, some 500 million smallholder farms like these exist throughout Africa, Asia and South America. Add up the people who live and work on these smallholder farms and the total comes to two and a half billion, a third of the entire global population. Astonishing, right? Hugh Locke (R) the founder of Smallholder Farmers Alliance. On these smallholder farms, yields are consistently low and poverty is usually the reality—but like my friends in Haiti, most smallholders operate as small businesses, and not just on a subsistence basis. This made it clear to me that smallholders, despite all their challenges, actually constitute the largest business category—no, rather the largest underperforming business category in the entire global economy. If we are true Baha’is speech is not needed. Our actions will help on the world, will spread civilization, will help the progress of science, and cause the arts to develop. Without action nothing in the material world can be accomplished, neither can words unaided advance a man in the spiritual Kingdom. It is not through lip-service only that the elect of God have attained to holiness, but by patient lives of active service they have brought light into the world. This is the work of a true Baha’i, and this is what is expected of him. – Abdu’l-Baha, Paris Talks, pp. 80-81. But back to Haiti. While the storm quartet of 2008 was the reason, and Richard St. Barbe Baker the inspiration, my impulse to plant trees would not have become reality had I not met and teamed up with Haitian agronomist and tree expert Timote Georges. We were both equally passionate about the need to plant trees and decided to work together. Our first decision: pay farmers to plant trees. To this end we sought sponsorship from a large global company with a tree for a logo: Timberland. They liked the idea in principle, but pointed out that paying farmers meant tree planting would stop the day the funding eventually stopped, and it was hard to fault their logic. At that point, Timote and I realized we had to approach smallholders as potentially sustainable small businesses that needed help to increase yields and profits, and somehow fit tree planting into that mix. The first challenge was that trees were already a big part of the smallholder business model. Cutting trees to sell as wood and charcoal accounts for 70 percent of Haiti’s total energy consumption. The reality? In Haiti, and in many other places around the world, deforestation is a profitable side business for farmers. So we began to ask ourselves: How do we fix that underlying problem? How do we save the forests and the soil and the Earth itself, by working with the people who depend on it for their livelihoods? 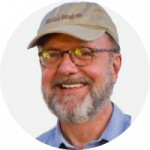 These essays were adapted from a TEDxTarrytown talk given by Hugh Locke on October 22, 2017.